My oldest formally finished with ‘school’ end of 2018 as she has completed her Cambridge A-levels. Results came out a few weeks ago and she did very well. With her leaving home to begin a new season in her life, I prepared a photo ‘tribute’ including photos from every year since she was born, and oh my goodness, what an unexpected trip down memory lane! While doing that I realized just how gradual growth happens when we are involved with it daily. Our children literally ‘grow up before our eyes’, and yet we don’t really see it happen. People who don’t see them on a regular basis will comment on ‘how they have grown’ especially physically, but how many of us actually see our children’s growth happen? It made me think about growth – emotional, social, intellectual and even spiritual growth. 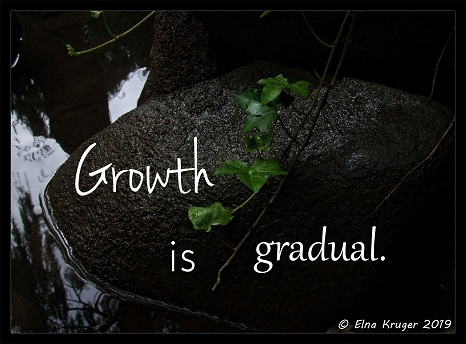 How often do we think we do not grow, when in effect we do – it’s just not so easy to see! Often we are so hard on ourselves to measure this growth too soon, whereas if we wait a while and measure it over time, we may see the growth for what it was over time! Just like a tree which grows day by day steadily yet unnoticed, so our children do grow ‘unnoticed’. We will appreciate progress better, if we allow ourselves a little more time. In our home (as I am sure in a lot of homes) we have a physical growth chart on a door, where a child’s height is recorded every birthday. What a useful tool in seeing the growth spurts they go through and get a feel for how they grow in a year! Sometimes one needs such a ‘chart’ to measure other aspects of growth also, to help us have a longer term view on ‘growth’ so we can be more patient with our children and give them enough time to ‘grow up’. I have found myself to be impatient at times, but when I look back and reflect over what happened over a period of time, I can appreciate it better. It also helps if you ask others as they can often be more objective in their view, and you will likely get more positive feedback than you thought possible. This idea of looking for growth over a longer period of time may also help in getting a better perspective even with regards to other things, whether this is progress made in a subject area, or learning a new skill or growing in character. We can also learn to be more patient with ourselves if we have a longer term view on growth and learn to ‘see’ it over time. You do grow, silently, unnoticed and gradually! Homeschooling Curriculum Guide would like to invite ANY subscriber who has something to share, something to say, or just want to contribute to encouraging others to please contact me. I am looking for a number of contributions to publish in the monthly ezine. Contact me either via phone on 0837112246 or via my personal email. Sometimes doing nothing leads to the very best of something.